Sixty percent of women in the U.S. are overweight, putting these women at higher risk for heart disease, stroke, diabetes, high blood pressure and some types of cancer, according to the National Women's Health Information Center. Weight loss for overweight or obese women is a matter of health and longevity, and shedding extra pounds means hacking away at excess fat throughout your body. For women, this means that weight loss can affect breast size and bra cup size, since fat makes up part of breast composition. Breasts are made up of fat, glands, milk ducts and connective tissue. Younger women have a higher ratio of glandular tissue to fat than older women. Significant changes in breast composition take place as estrogen levels decrease during menopause. Glandular tissue shrinks with age and hormonal fluctuations, making room for additional fat tissue. These factors impact the extent to which weight loss affects bra cup size. The potential for changes in your cup size depends on how much weight you lose, as well as your age. 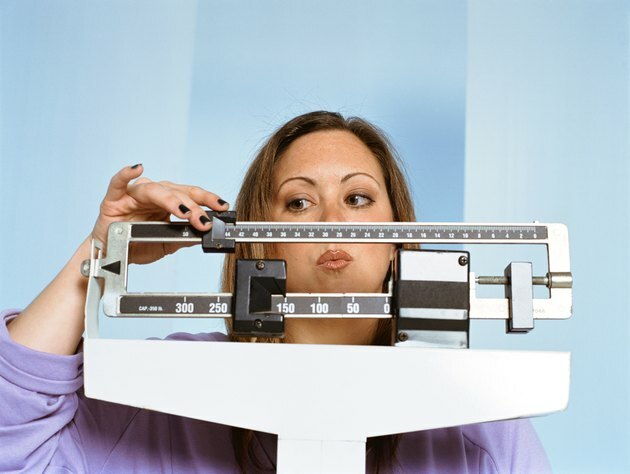 If you lose 5 to 10 lbs., for example, you're less likely to see changes in your cup size. However, if you have a high percentage of breast fat, you may notice a change even with a small amount of weight loss. A significant amount of weight loss is more likely to affect your cup size, regardless of your age. Take bra size measurements once every four to six weeks as you lose weight so that you'll know if you need to invest in a different size bra. With a measuring tape, determine the circumference in inches of your chest area above your breasts and just under your arms. Keep your arms at your side for the most accurate body size reading. After you measure the fullest part of your bust line in inches, subtract your body size measurement. If the numbers are the same, you need a AA cup size. Every inch in difference indicates one cup size, so a 1-inch variable means you need an A cup, a 2-inch variable indicates a B cup, and so forth. Although you can't tell your body where to lose fat, you can work the muscles underneath the fat to tone and firm your body while you lose weight. Work to strengthen your pectoral muscles with body-weight exercises such as the bent-knee push-up and push-ups with single leg raises. You can also target your pecs with dumbbell presses, dumbbell pullovers and the dumbbell fly. Can You Lose Weight Without Shrinking the Breasts? Why Do Women Lose Weight in Breast Before Thighs? How Can I Lose a Cup Size by Exercising?